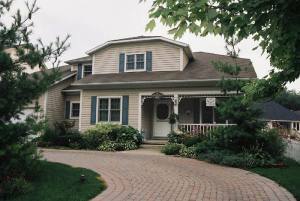 Relax in a comfortable, spacious home in Niagara-on-the-Lake`s Old Town, close to the shops and theatres. Award-winning wineries and golf courses are just minutes away. Niagara Falls' manay attractions are a short 20-25 drive. The Brass Bell, with its warm pine floors throughout, is newly decorated in a mix of contemporary and traditional styles with a light nautical touch. The soft, melodic, chimes of the ship`s clock will call you to a sumptuous breakfast. Relax on the verandah enjoy the gardens. Complimentary spring water and soft drinks are available in the dining room. Each room has a queen-sized bed, a ceiling fan and an ensuite with walk-in showers for comfort and privacy. Guests can enjoy a comfortable sitting room on the upper level as well as full access to the wardroom (living room) on the main level. It is fully air conditioned, adult-oriented, smoke-free and pet-free (due to allergies). 2 km to town centre. Free Wi-Fi. Full multi-course breakfasts featuring local fruits when in season. Coffee, tea, juice. Chef's surpise. Pateries and muffins made fresh daily. Backyard cherry trees in bloom. Brass Bell front entry hall.